Independent MPP Randy Hillier scrums with reporters at the Ontario Legislature in Toronto on March 19, 2018. 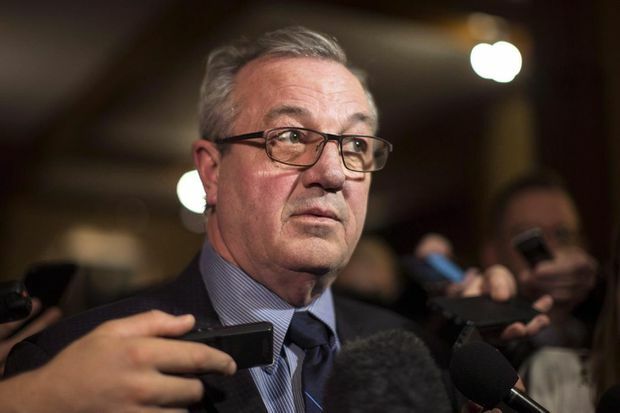 Independent MPP Randy Hillier is blaming backroom operatives for his recent ouster from the Progressive Conservative caucus, alleging he was expelled in part for raising concerns about possible illegal lobbying by the Premier’s close friends and advisers. While the unproven allegations prompted the NDP to say it would be referring the matter to the Ontario Provincial Police, Premier Doug Ford’s office called the unspecified claims “absurd and categorically false." Mr. Hillier was permanently kicked out of the PC caucus on Friday by Mr. Ford, after being indefinitely suspended last month for allegedly making “disrespectful comments” to parents of children with autism. Mr. Hillier said the comments, which included the phrase “yada yada yada," were directed toward the NDP, not parents. In a statement released on Monday, Mr. Hillier accused Mr. Ford’s chief of staff, Dean French, and Chris Froggatt, who chaired Mr. Ford’s transition team after last June’s provincial election, of plotting to remove him from caucus. “My very first private meeting with Dean French after the June election was at a BBQ at the Ford residence on Aug. 2. During our conversation Dean informed me that he ‘wanted me out of caucus.’ For the following seven months, Dean French and Chris Froggatt engaged in an underhanded and relentless campaign to achieve that end,” Mr. Hillier said. Mr. Hillier listed 11 reasons he says he was expelled from caucus, including refusing to stand and applaud for routine matters. The MPP for Lanark-Frontenac-Kingston, first elected in 2007, said he also raised concerns “of possible illegal and unregistered lobbying by close friends and advisers employed by Premier Ford.” He did not specify who he was referring to, or respond to follow-up requests seeking clarification. “These outrageous demands and distortions/corruption of my responsibilities culminated with the following condition of reinstatement to the PC caucus. Even when the government is in violation of the law or engaged in unlawful activity, I must accept these decisions as a team member and neither dissent in caucus nor speak publicly of these illegal/unlawful actions,” he said. After question period on Monday, NDP MPP Taras Natyshak said he would be forwarding Mr. Hillier’s letter to the OPP. “When you hear these types of allegations that are serious and concerning and disturbing, this has to be given to the proper authorities,” he said. The OPP confirmed late on Monday it had received the information. Mr. Ford’s director of media relations, Simon Jefferies, denied the allegations and accused Mr. Hillier of failing to take responsibility for his actions. “Everything Randy Hillier outlined in his letter is an outright lie. These fabrications are absurd and categorically false," he said. “This further shows Randy Hillier never wanted to be a true member of our PC team despite repeated attempts by Premier Ford to engage him as an important member of our caucus,” Mr. Jefferies said. Mr. Hillier did not specify in the letter about whom he was making the allegations. “I don’t lobby. I provide strategic advice on communications and government relations. Others in my firm are registered lobbyists and provide that service,” he said. Mr. Ford named Mr. Froggatt as chair of his “election readiness committee" in January, more than three years ahead of the next expected voting day. Mr. Froggatt chaired Mr. Ford’s transition team as the PCs prepared to form government. He also helped Mr. Ford win the PC leadership and was vice-chair of the party’s campaign. In August, Mr. Froggatt and his business partner established Loyalist Public Affairs, a lobbying and strategic communications firm. Mr. Froggatt, who has worked as a lobbyist at National Public Relations, is not registered in the provincial lobbyists registry. However, others at Loyalist represent a range of companies, including Bruce Power Inc., Canopy Growth Corporation and Uber Canada Inc. Under provincial law, former senior public servants must observe a 12-month cooling off period before they can lobby ministers they worked for during their last year in government. In addition, former public servants face the same year-long ban for lobbying staff in ministries in which they worked within the previous year. However, the integrity commissioner says there is no cooling off period for members of a transition team.